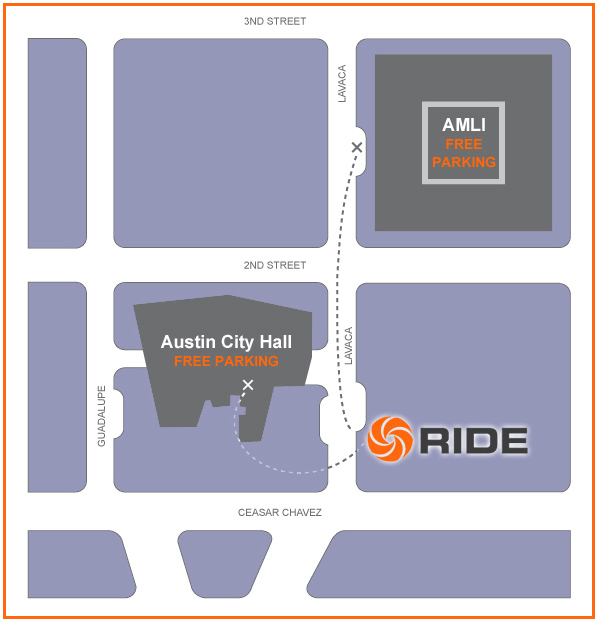 RIDE Indoor Cycling is located at 117 Lavaca Street in the heart of downtown Austin Texas. FREE PARKING is provided at three locations. Daytime parking is available across the street at Austin City Hall. Daytime and evening parking are available at the AMLI Downtown apartment building on Lavaca, between 2nd and 3rd. After 4pm and when there are special events Downtown, validated parking is only available at the AMLI Downtown apartment building. On weekends additional parking is available at Silicon Labs, right above RIDE. Enter on Colorado Street between 2nd and Cesar Chavez. Please remember to bring your parking ticket for validation.